Use a readily available solution to solve your complex networking issues with the HP 2920-48G-POE+ rack-mountable 44-port Ethernet switch. 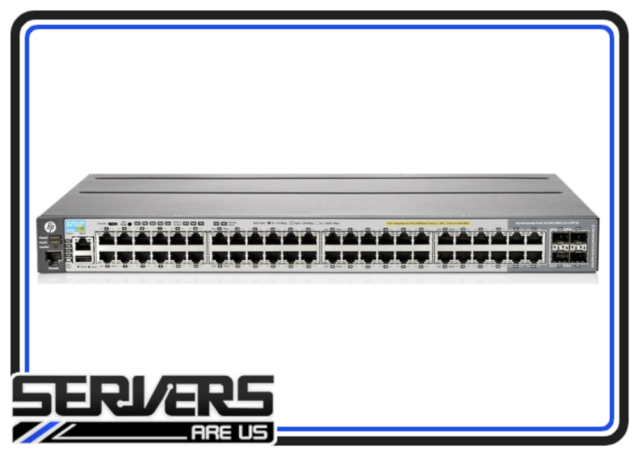 This device has numerous switching options that can be used to easily setup a dynamic network system with flexible uplinks and stacking. It is equipped with 44 RJ-45 auto-sensing and four RJ-45 dual-personality 10/100/1000 PoE+ ports, four Gigabit Ethernet ports, and three expansion slots. Additionally, the switch features multiple performance software enhancements including static and RIP routing, robust network management, enterprise-class features, and free software updates - all needed to design and implement a scalable, reliable network infrastructure. To eliminate functional lags and ensure optimal speeds, the switch is powered by Tri-core 625 MHz ARM processor, 512 MB SDRAM, and 1GB flash memory - these components ensure that the device achieves low latency rates, and maintains a high throughput and switching capacity.